Smartwatches are becoming more common, but still don't have the killer app to bring them mainstream. Could health metrics be that app? Read on to find out. Despite the initial hoopla around smartwatches, it’s perhaps fair to say that they’re a technology that has yet to really find a use. Possibly the most common application is in health and fitness, with the watches capable of providing a range of fitness tracking services. A recent paper highlights how they might have more meaningful applications, especially in elderly care environments. 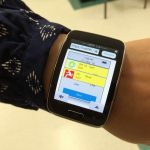 Researchers from Binghampton University have developed a smartwatch app that they believe will allow nurses in care homes to respond significantly faster to incidents involving residents. The system, which incorporates all of the safety systems currently used in nursing homes, including call lights and bed alarms, aims to support a quicker response to incidents by staff. In initial tests the app has done just that, and the team hopes to test it further to see just how robust it is. Nursing homes typically try and address this issue with things such as a call light system that allows the resident to press a button to call for help. More advanced homes come with pressure sensors built into beds and chairs so that staff is alerted when residents try and move. The authors suggest however that many times nurses are on the move and so may not hear the alerts. “With our system, we provide an informative and customized message for different alarms. The message contains the resident’s name, the type of alarm, the room number and the CNA who is responsible. The smartwatch will be on the CNA’s wrist, so it’s accessible all the time. They can see the message, hear the alarm, and feel the vibration, whether they are working down the hallway or inside the rooms,” they say. The app aims to be customized specifically to the needs of each nurse so that they get alerts relevant to the residents they work with on each shift. If an alert is raised, the nurse is notified of both the identity of the nurse, the nature of the issue and their location. “The alert message is more informative than the existing system and, at the same time, it will help nurses to prioritize. We will mark or highlight alarms from residents who are actually assigned to whoever is using the app,” the team says. “The CNAs are exited about this idea and they are interested in this device. They would like to see the adoption of new technologies in their working environment because all of the problems in their current situation,” they continue. The next stage is to undergo more rigorous testing in a nursing home environment. Whilst they accept that equipping each nurse with a smartwatch will be an additional expense in an already highly money poor sector, they hope that the benefits in terms of service will outweigh this extra cost. How Effective are Mobile Apps at Improving Our Health?